WALTHAM - So many pieces of the Celtics remain from last season's champions that it may be easy to overlook the missing parts. Last season, veteran P.J. Brown ditched retirement and tossed on a Celtics jersey in March, giving them a 6-foot-11-inch presence and a midrange shot that became crucial in the postseason. This season, Brown did not re-sign and left the Celtics looking to Leon Powe and Glen Davis to prove they can fill the void. Davis, a 6-9, 289-pound forward, is in his second season and focused his energy toward developing a midrange shot during the summer. Powe, a 6-8, 240-pound forward, is in his third season and improving his defense. "We can do the job," Powe said. "We've been doing a good job right now and playing well together, and just playing with our team. As we've been winning, the second unit has been doing well together. We have to continue that and covering for each other and playing good defense because that's where it starts at and works out from there." Davis and Powe will have to do as much as they can because the Celtics may find it challenging to bolster the lineup with a veteran. High salaries take up the bulk of the roster, while players like Powe and Davis, who make less than $800,000, fill in the rest. The Celtics may not want to part with one or more of their younger players to gain a more experienced big man down the stretch. Both Davis and Powe were considered important factors in the championship run, said president of basketball operations Danny Ainge. 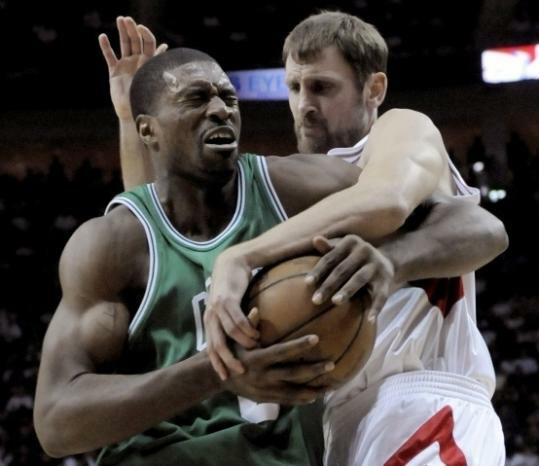 "I think they're progressing," Ainge said. "Defensively, they are both significantly better than they were. Glen is really making strides with that midrange shot, which we need from him. But I think the biggest thing is that when you do get young guys like [Davis and Powe], you need them to buy into winning and buy into the role, how important every possession is defensively. "Doc [Rivers] has done a great job of taking a couple of kids that are second-round picks that have high hopes and want to be paid and getting them to buy in." Rivers said he reminds Davis to keep up with his conditioning and encourages Powe on defense. When in shape, Davis impresses with his quick feet, Rivers said. Powe is a strong defender but has to improve on keeping up with rotations. They are all elements Rivers said both continue to improve on, but there is one area in which they cannot. "What they don't have is length," Rivers said. "Either you have it or you don't. At the end of the day, when you're 7 feet and you put your arms up, that's an obstruction for the offensive team. That's the one thing we've lost with P.J." Powe and Davis agreed they both paid attention not only to how Brown played but how he prepared for games and interacted with teammates during his brief time with the Celtics. "He was the consummate professional, and that's what you want," Powe said. "He was a good role model for any and everybody. He just worked so hard. He would talk to me about on-the-court stuff and off-the-court stuff, about how to be a better person and a better NBA player. Sometimes people don't take the time to tell you that, but P.J. did." Powe and Davis will be free agents at the end of the season and have that motivation as well as being on a team that gets plenty of exposure. When reports surfaced that the Celtics were interested in forwards Antonio McDyess and Robert Horry last month, Davis and Powe said they did not allow the chatter to distract them. If the Celtics decide to bring in a veteran, Davis said it only means he has someone else to learn from. "I'm cool with anything the organization is cool with," he said. "We're winning championships, and I love that." Tony Allen isn't expected to play tonight against Portland, Rivers said. Allen, who sprained his right ankle against Orlando Monday, didn't participate in yesterday's abbreviated practice. He also sat out Wednesday's 114-96 win over Indiana. As of yesterday afternoon, Rivers said he did not have a report on Allen but assumed he would not play. "I haven't seen Tony walk, let alone play, so I would guess he's not going to play, but I really don't know yet," Rivers said. Marc J. Spears of the Globe staff contributed to this report; Monique Walker can be reached at mwalker@globe.com.